St. Patrick’s Day is just around the corner. Does your family have any special traditions for St. Patrick’s Day? I think this year we’re going to start a tradition of building a friendly leprechaun trap (here are some fun ideas). 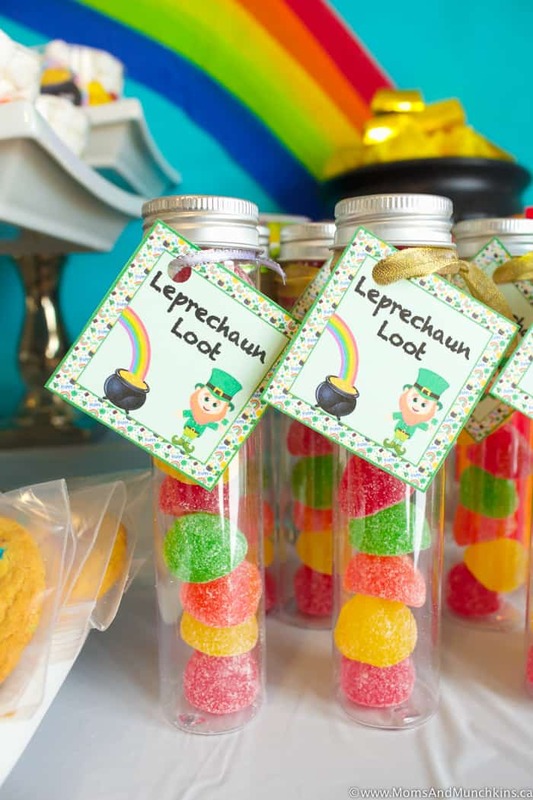 It will be fun to see if we can trick a little leprechaun – I’ve heard that they are pretty tricky! 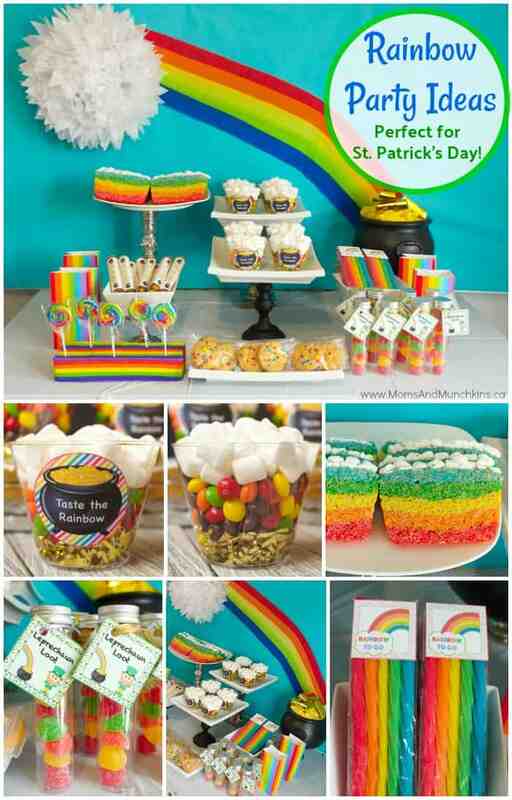 If you’re planning on hosting a St. Patrick’s Day Party, we have some fun Rainbow Party ideas! 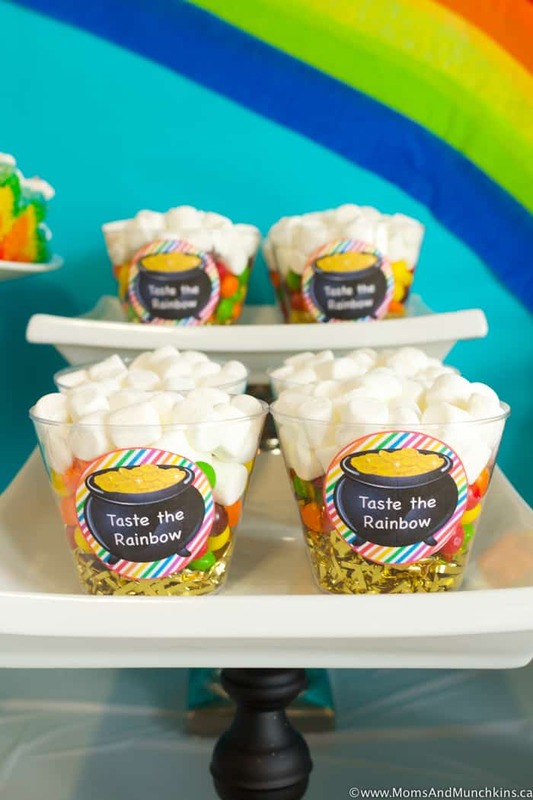 Yes, we have free printables and rainbow recipes to share with you too. Let’s jump right into it! 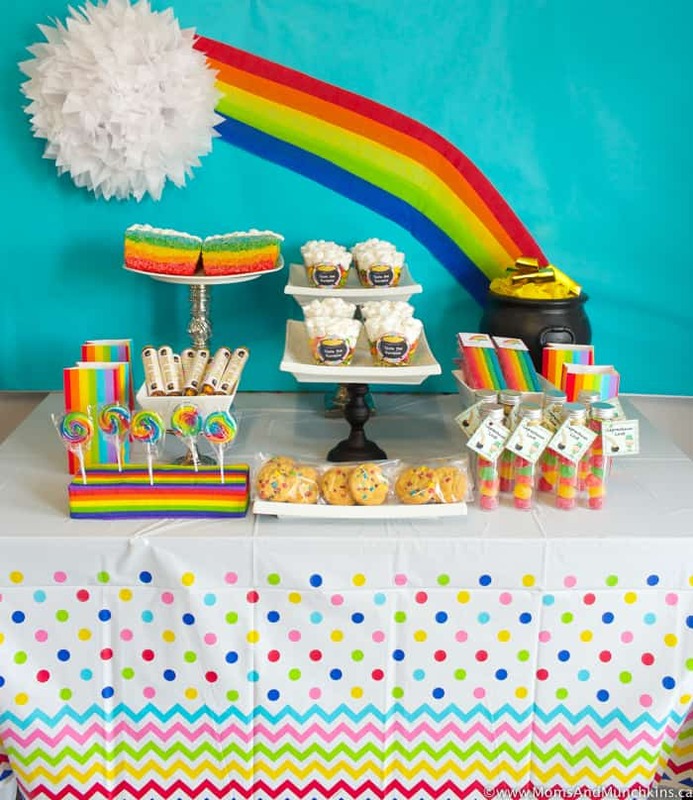 For the party backdrop here, I used 3 white poster boards from the dollar store. I taped them together and covered them with a sky blue wrapping paper. 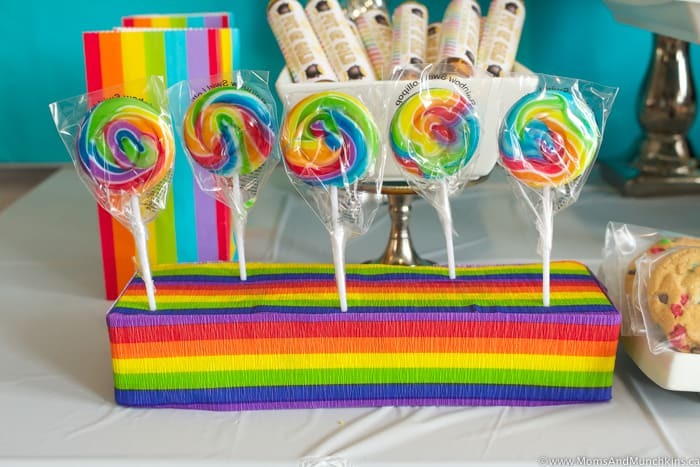 I used a white fluffy tissue paper puff for the cloud and crepe streamer paper for the rainbow. It was incredibly easy to make! 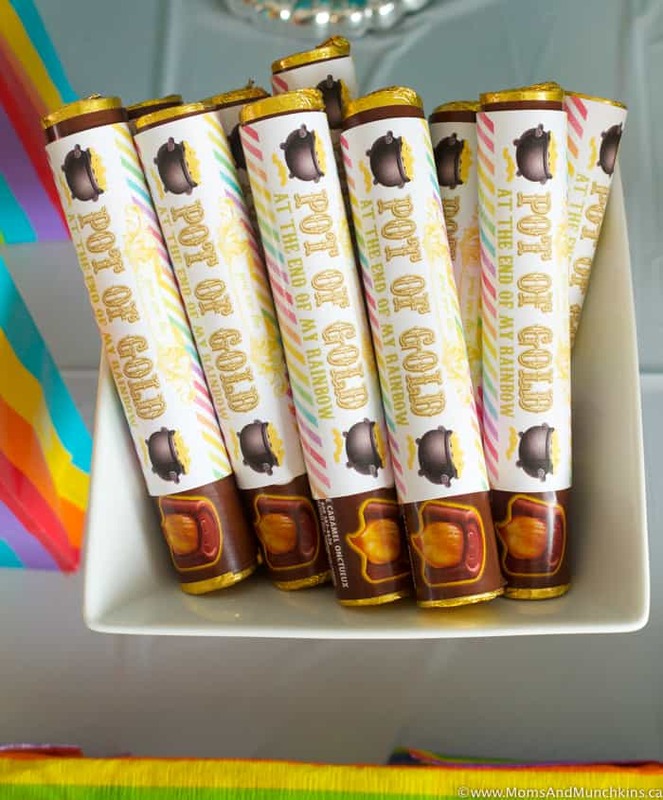 I had the rainbow stop at a “pot of gold” – a black pot from the party store filled with yellow streamer paper and some gold treat boxes. 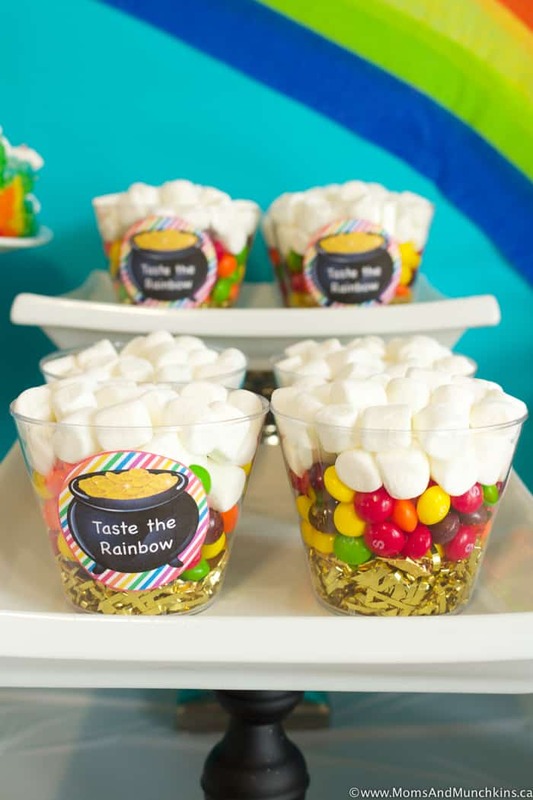 For tableware in your St. Patrick’s Day party, you can use a variety of colors (all the colors of the rainbow) in paper plates, plastic utensils, napkins and paper cups. 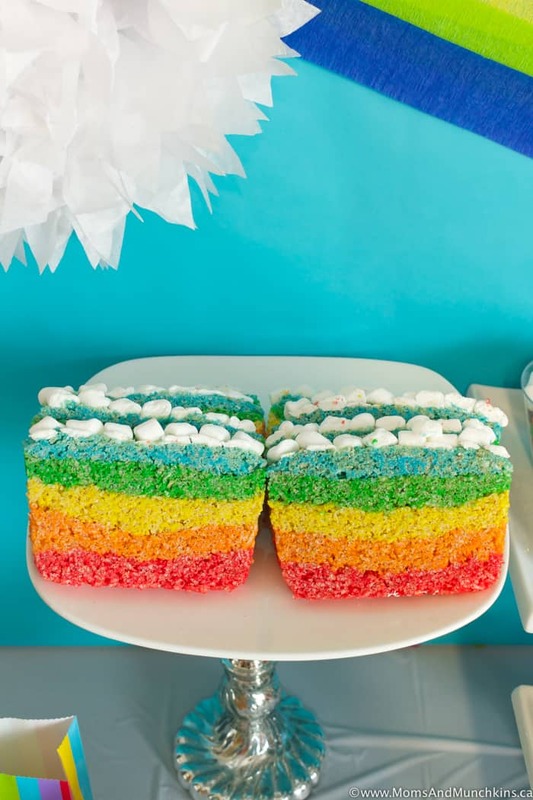 For a St. Patrick’s Day Party theme, you don’t have to stick with the traditional color of green. 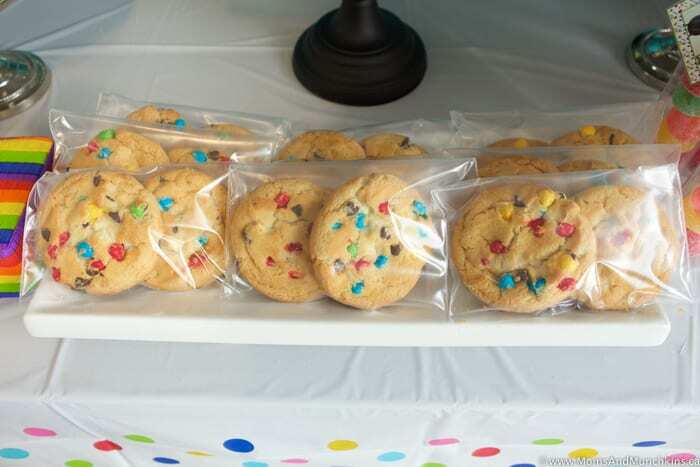 Now let’s get to everyone’s favorite part of a party – the treats! 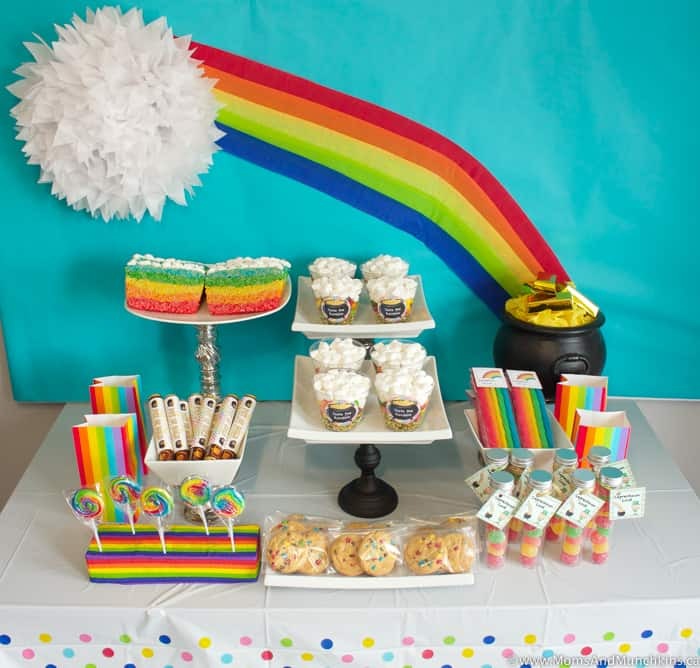 I went with a variety of rainbow treats for this party including a Rainbow Rice Krispie Cake (recipe here), Taste The Rainbow cups of Skittles (instructions and printables here), Rainbow To Go licorice (grab the free printable here), Leprechaun Loot gumdrops in a candy tube (grab the free printable here), rainbow Chips Ahoy cookies, “You Are The Pot Of Gold At The End Of My Rainbow” wrappers over Rolos (free printable here) and rainbow lollipops found at my local party store. 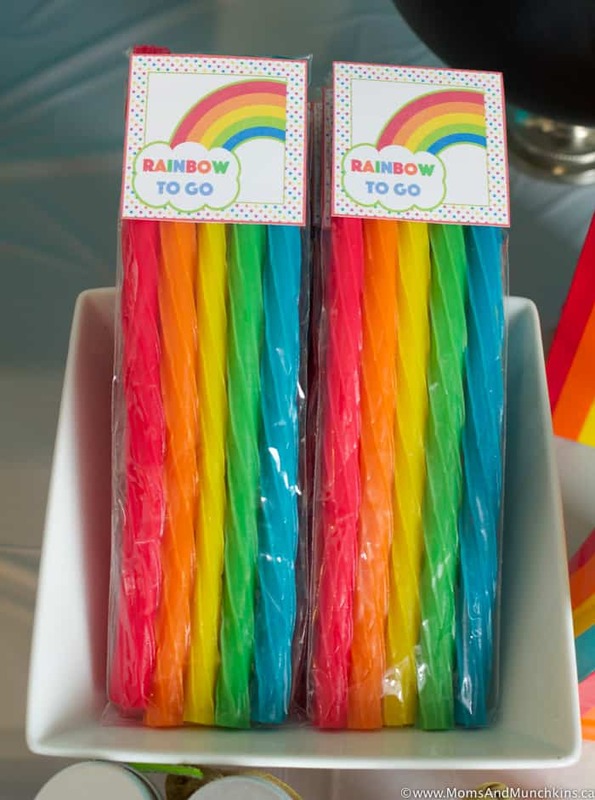 Yes, that’s a lot of sweets for one party so you may want to set out some rainbow treat bags for guests to take home rainbow treats as a party favor. Visit our St. Patrick’s Day page for even more fun ideas including more parties, free printables, treat recipes and more! New holiday ideas are being added all the time. Stay updated on the latest ideas for holiday fun by following us on Facebook, Twitter, Pinterest, and Instagram. 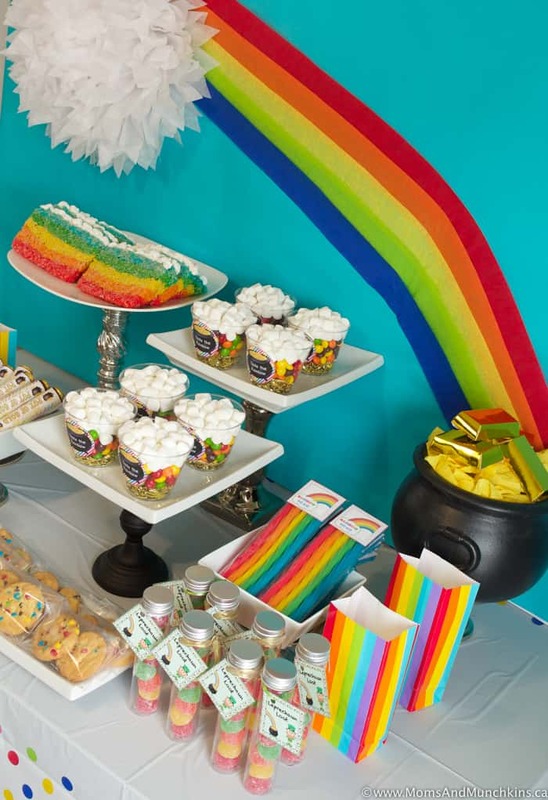 Okay, now this party looks just too cute! Thanks for sharing some fun St. Paddy’s Day ideas with us!